Obviously, Light’s soon-to-be job at the Library of Congress is not without precedent among the list of jobs held by SAA presidents. But in her blog post explaining her resignation, Light cited potential conflicts of interest between her paid position and her SAA position. The status of the Library of Congress as a legislative agency has not changed, but Light evidenced concern there could be confusion about her possibly using her position within SAA to advocate specifically for her agency. In recent years, SAA has expanded its advocacy efforts with the Committee on Public Policy and the Intellectual Property Working Group. Rather than frequently needing to recuse herself from SAA activities, Light decided the organization would be better served by her resignation. 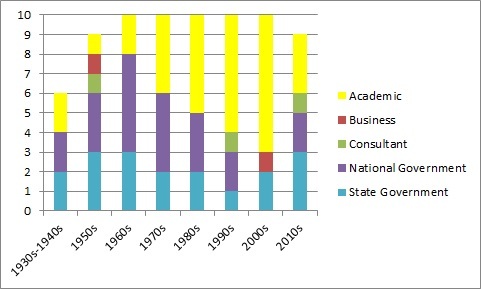 In addition to answering my question about Light’s predecessors, this little research project has also demonstrated the growing prominence of academics within the leadership of SAA along with negligible representation of business archivists. I wonder if the explanation for this discrepancy is no more complicated than the fact that those working at academic institutions are more likely have institutional support for professional engagement. (The list on the SAA website does not distinguish between archivists practicing at academic institutions versus professors teaching at these institutions, but in looking at the list, I recognize both groups are definitely represented.) On the other hand, it seems that archival work is often a difficult sell in the business community, so it may be harder for these archivists to justify devoting time to participation in an outside organization.